A Guide to Designing Sustainable Writing Courses from Scratch - Guiseppe Getto, Ph.D.Guiseppe Getto, Ph.D. This is a guide for for teachers at any educational level, and in any discipline. The goal is to provide a simple, understandable framework for designing writing courses. This guide has been designed based on the collective experiences of Jessica Rivait, and myself, experience that spans many years of curriculum design, teaching, and research into teaching writing. Needless to say, this is our take on the essential components of a writing curriculum. Other professionals, within our broader disciplines of rhetoric and composition and technical communication, may disagree. This is an open resource and we invite discussion if anyone would like to join us in improving it. This guide is best used in consultation with a writing expert from one of the above fields, or from the field of education. In our experience, these folks are excited to work with anyone interested in designing sound writing curricula. Look up your nearest college or university and see if someone is available to help you. Or, contact us for a consultation or referral. This guide is also not necessarily best done in a stepwise fashion, though we are suggesting a plausible order below. Like writing, designing a curriculum is a reflective process. You might find yourself jumping around, revising one part based on what you come up with in another, etc. : that’s good. That’s what you should be doing. Good writing curricula are like living beings: they evolve over time and require nurturing and care. This also means that you have to give yourself a break when (not if) you don’t “get it right” the first time, or the 10th time, you teach your curriculum. The best way to design a curriculum, is to come up with the best plan you can, and then to try it out, and then to redesign it based on your teaching experiences. Taking notes as you teach and asking for feedback from colleagues and students, are also essential parts of this process. 1) Research. Every pedagogy starts with research into the pedagogies of others. If you are working with a writing expert, they can provide you with best practices and pedagogical orientations. Otherwise, see the Other Curriculum Design Resources section below to help you with your research. 2) What are the primary aims/goals of the writing curriculum you are designing? What kind of writing are you trying to teach (academic writing, business/workplace writing, technical writing, etc.)? 3) What are the objectives of your institution, regarding teaching and learning? These are often vague, in our experience, but should be taken into account to protect yourself from professional repercussions. If you disagree with these expectations, you should talk to your administrators and lobby for changes. 4) Design a teaching philosophy statement for yourself as a teacher. This statement should answer the question: why are you a teacher? What do you hope to do for the world through teaching? What concrete experiences exemplify this orientation to teaching? Here is Guiseppe’s teaching philosophy to consider. Another essential step of curriculum design, which takes us to the first stage of practical concerns, is thinking about the main parts of your curriculum. Writing curricula exist in smaller pieces, but smaller pieces that lead to larger pieces. This is what is known as the art of scaffolding, or “the support given during the learning process which is tailored to the needs of the student with the intention of helping the student achieve his/her learning goals ” (from the link). Below are some suggested chunks of a writing curriculum, which include questions and examples that will help you link all the chunks of your curriculum together as you build them. Homework Assignments: can be defined as any work students do outside of officially scheduled class time, typically work that involves reading and writing. These are typically guided experiences that lead students to do some task that introduces and/or reinforces a concept or practice important to your class. The easiest way to think about homework assignments is by dividing them into reading and writing, as I did in this introduction to college writing class. In this class, two types of experiences functioned as homework: “Homework Assignments” and “Tumblog Entries.” If you scroll down the page I’ve linked to, you will see that in each case, I give very explicit instructions on what to read and what to do with information gleaned from that reading. Here is a another example from a class in technical writing. Essential questions: what kinds of experiences do you want students to have when they’re not in class? How will these experiences help students learn essential concepts/practices from your class? How can these experiences create fuel for other parts of your curriculum? Activities: can be defined as experiences students engage in that are coordinated by you as a teacher and that often involve interaction in groups (either as a class or in small groups). You will notice as we precede that there is some blurring amongst the these categories; could you assign an activity as a homework assignment, for instance? If it is appropriate to do so: sure. From the same link to the introduction to college writing class, you can see there are two activities I asked students to do, activities that I’ve both facilitated in class and assigned outside of class. The most common activity I did in the technical writing class, was to have students discuss, both in small groups and as a class, the work they’d done for their homework. This reinforces learning, and creates a good foundation for introducing the next assignment students will be working on. As we’re talking about a writing class, too: remember that writing is an important activity to have students do in class as well as out of class, in small groups as well as individually. Studies have shown that students who spend more time writing during class retain information better, become better writers, and overcome anxieties about producing writing. So: don’t ever be afraid to give students plenty of time to work on assignments in class, or even just to “free write” for a few minutes about a topic of their choosing, or in response to something you’ve been discussing in class. Essential questions: what kinds of experiences do you want students to have in class? What kinds of interactions can students have both with each other and as a class that will facilitate learning and sharing of ideas? How will these interactions help students learn essential concepts/practices from your class? How can these interactions create fuel for other parts of your curriculum? Discussions: can be defined as structured or semi-structured conversations that teachers facilitate with their students, either one-on-one or as a group. In writing classes, discussion take three typical forms: 1) whole class discussions, 2) small group discussions, and 3) individual conferences. The easiest way to understand these different forms is to think about them as all part of the same process. Discussion in a writing class is driven by inquiry, or the effort students engage in to solve problems and answer questions. All you need to have a good discussion, is a question or series of questions that students need to answer to do well as writers. Questions should be simple enough for students to understand, but hard enough that are stretching to answer them. They should also be questions that you, as a teacher, know some answers to, but which you have not completely answered yourself. This is an essential facet of what is known as problem-posing education. Essential questions: what kinds of questions do students need to answer in order to effectively perform the type of writing you’re teaching them? What kinds of problems do they need to solve? What specific questions will best fuel discussion? What questions are best taken on by students in small groups (these tend to be smaller parts of bigger questions being asked of the class that the students answer and then report back to the whole class)? How will these conversations help students learn essential concepts/practices from your class? How can these conversations create fuel for other parts of your curriculum? Major Assignments/Modules: homework assignments, activities, and discussions should all culminate in larger written products that exemplify learning. The most common form of major assignment in a writing class, of course, is a research-based essay (although students may produce other kinds of essays, desktop publishing projects, and multimedia projects). Regardless of what kind of major projects you create, however, you should use homework assignments, activities, and discussions to aid students in mastering the skills they need in order to successfully craft their writing products. While some teachers use multi-week units to measure progress, other teachers use weekly or bi-weekly modules (like these) to help students complete major assignments or a semester long project. However you scaffold your major assignments, you should make sure to build in time for having students create small chunks of their project and to receive both feedback from you and from their peers (the activity scheduled for 9/14/11 at this link is an example of how to scaffold peer feedback: introduction to college writing class). This strategy often prevents plagiarism and results in better writing than having students do most of the writing process outside of class time. Essential questions: what kinds of written products do students need to create in order to learn the type of writing you’re teaching them? How can they best build those products through smaller chunks of writing produced throughout the class? How will you introduce major assignments to students? What kind of document/assignment prompt will you give them at the beginning of a major assignment (examples of these from the composition class-example 1, example 2, example 3-and the technical writing class)? How will this assignment prompt correspond with your daily lesson plans? How will the major assignment prompt illustrate how you are helping students learn essential concepts/practices from your class? Final Project: is an end-of-the-semester or year assignment that serves as a capstone experience for your course. 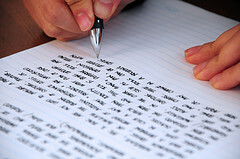 Many teachers from non-writing-focused disciplines assign a term essay or final exam to students. Writing instructors will often assign research projects or multimedia projects that require a semester or year’s worth of planning, inquiry, and analysis. Some assign a portfolio project that asks students to revise and showcase their best writing from the term. The final project should be a natural extension of the major assignments and other writing chunks that students have already completed. Since the final project usually constitutes a large percentage of students’ final grade for the course, students should receive ample support and time in which to complete the project. Writing teachers typically use final projects as an indicator of the effectiveness of their curriculum. Here’s an example project that would work well as a final project for a college writing class, and here’s the final project from the technical writing class. Not all writing teachers have summative final projects for their classes, but many do. Essential Questions: How does your final project sum up the writing experiences of students who are enrolled in your course? What preparation have you given them beforehand to prepare them to produce this final product, including time to invent ideas and write? How will you communicate your expectations for the final project? How does your final project ask students to mobilize the writing work they’ve done/what they’ve learned in all the other chunks of your class? Technology is an essential component of any writing class, be it pens and paper, word-processors, web browsers, or video production software. Many writing teachers use podium classrooms to facilitate classroom note-taking or to supplement discussion with visual aides. Writing teachers may use instructional technologies like Skype or Google Chat to bring an author or writer to virtually “visit” their classrooms, or to promote peer work outside of class. More commonly, writing instructors post their instructional materials for students online in Content Management Systems like Blackboard, WordPress, or Google Drive (formerly Google Docs). Some writing teachers are also starting to have students use advanced digital tools for writing. These teachers believe that students need not only use digital media like websites for research, but also should be able to compose digital media themselves. Here’s a link to a guide for developing your own personal toolkit of instructional technologies: The Art of Fostering Student Writing in the Digital Age. Whatever technologies you use, it’s essential that you are prepared to show students how to use technologies in the way you intend for them to be used. Most importantly: you should use technology to better meet your educational goals, not as an add-on to your curriculum. There is a substantial amount of high-quality resources addressing the teaching of writing. While the composition textbook industry is a good place to start, there are also many excellent materials available free online. Below is a partial listing of websites that will aid you in locating readings to use. Your curriculum should not stay static over time; your teaching approach and associated routines should shift as you test out and reflect on whether or not they work in the classroom. There is no one-size-fits-all approach to assessing writing. Although many teachers associate “assessment” with standardized curriculum, teachers can assess original curriculum that they design themselves. Besides formal teacher evaluations conducted by senior faculty, teachers can take an active approach to self-monitoring, -reflection, and -correction throughout a course. Not surprisingly, these methods involve networking with other people who care about the quality of teaching and learning; after all, teaching is not an isolated activity, but a highly social one. These activities are also all initiated by teachers themselves: many teachers are not waiting to be evaluated by students, senior faculty, or administrators, but are actively seeking their feedback in a structured way. Of course, teachers can also formalize their active assessment process by conducting teacher research. Alternatively, they may actively seek out an educator skilled in assessment to provide them with feedback (or agree to participate in a teacher research study). These more objective methods of assessment are more time-consuming, but they may provide feedback that a teacher may not receive otherwise. Regardless of how a teacher pursues or utilizes assessment techniques, the primary goal of doing so is to evaluate how a given pedagogy/curriculum is working. In all courses, and with all teachers, there are strengths and weaknesses. Teachers self-correct when they change their teaching approach, routines, or curriculum based on assessment to build on strengths and to work on eliminating weaknesses. Teachers who use this approach believe that the pilot version (or first version) of a course should be the weakest and that subsequent versions of a cours should become stronger over time. When teachers engage in this approach, their courses become sustainable, meaning adaptable and better able to meet typical student needs and to respond to shifting educational trends and institutional learning requirements. Courses that are not assessed and revised on a regular basis do not typically respond well to student needs or to institutional expectations. Such courses may need a significant overhaul at some point (which takes more time than actively tweaking over time), or may be dropped from the school schedule altogether due to lack of enrollment/interest. A syllabus is a basic roadmap for your course. It communicates learning goals, expectations, and the framework for the course. Although it is an institutional document (often reviewed and archived), it serves as an important tool for teachers and the students enrolled in their courses. Syllabi often include instructor contact information, a course description, learning goals, materials requirements, minor and major assignment descriptions, grading criteria, class and school policies, support information, and a schedule. These are the basic building blocks of a syllabus. But there is no one standard for effective syllabi. While syllabi may share common sections and functions for teachers, students, and administrators, syllabi are often customized by instructors to illustrate their own personalities, teaching beliefs, and teaching styles. That said, teachers who produce syllabi often look to other teachers or educational researchers to discover the latest trends in syllabi design; as pedagogical trends change, so do syllabi design practices. When writing instructors design syllabi, they include a few sections that other instructors may not include. For instance, they are likely to include sections that address writing support. They may list their own availability outside class. Additionally, they often provide information about extra-classroom writing support (via school writing tutors, or online website databases or tutorials). These features often distinguish writing class syllabi from other types of syllabi. Many of these sections have “boilerplate” or standardized language for inclusion.